Happy Friday all!! 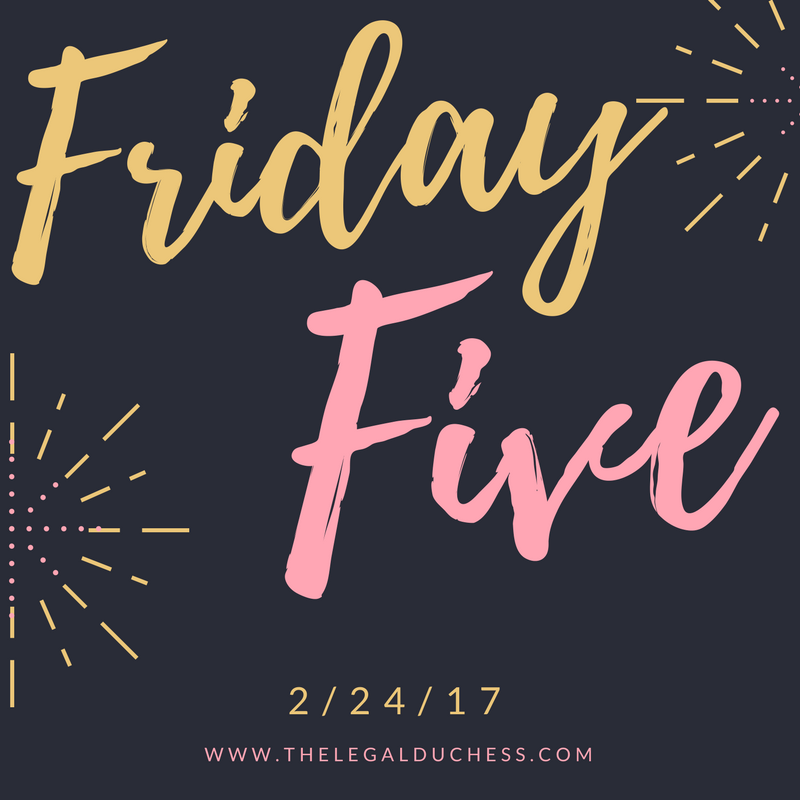 I am starting up something new- I am calling it the "Friday five". Basically it is just me sharing five things that have piqued my interest throughout the week. Please let me know thoughts on this new blog idea! It has been a lovely week around here. The weather has been absolutely gorgeous- 50 and sunny every day. I am loving every minute but it makes sitting in class all day so much harder. I just want to be outside. School is crazy busy as ever; we are starting appellate briefs, pickign classes for fall and trying to keep up with day to day reading and outlining. This weekend I am planning to play catch up. ..Oh and I am going to see Eric Church in concert on Saturday! This was my Christmas present to my hubby and we are so excited to go see one of our favorite artists in concert (and it will be a great homework break). They released more footage this week and my heart can't handle it. Emma Watson is the perfect Belle... hearing her sing and seeing her act in the part just puts it over the top. Also, the new rendition of Tale as Old as Time by John Legend and Ariana Grande- phenomenal. Playing it on repeat (yes I am that nerd). March 17th cannot come soon enough! I realize I am pretty late to the game on this show but it just came on Netflix and I finally found some spare time to watch. It is one compelling drama of one of the craziest criminal trials in American history. The story alone is enough to draw you in but the style and acting of the production is truly fantastic. Seeing the legal workings as a law student is really interesting; some of those "theories" we talk about are applied and this is real life. I have been watching an episode every night while I cook dinner and it certainly helps make chopping veggies more exciting! I finally caved and ordered a FabFitFun box. I have been seeing them EVERYWHERE and they just look like such a fun little box of "treat yo' self". Eight weeks into the second semester of law school, I was in need of something to look forward to. It includes $200 worth of fun products for just $49.99 (use my code for $10 off your first box: http://xo.fff.me/e4z5s) My box has not come yet but I will be sharing a full review when it arrives. I can't wait! I have been OBSESSED with this for the last few weeks. It is so simple and so yummy. I simply put quick oats, milk, plain vanilla yogurt and chia seeds in a little mason jar- pop it in the fridge overnight. In the morning, I add some fresh fruit and it is the quickest, easiest, yummiest and healthiest breakfast. I am notorious for sleeping in until the last possible second so knowing my breakfast is ready to go makes my mornings a lot smoother and those extra 10 minutes in bed all the sweeter. This movie (finally!!) came out on DVD and I picked it up right away to watch. We had wanted to go see it in theaters and just ran out of time so this was a long time coming. What an incredible story of conviction and courage. I laughed, I cried and overall, I finished the movie in awe of the mental toughness and insane courage of Desmond Doss- he is an American hero. The movie was extremely well done and the acting was impeccable. I always love a good war movie (it's the history nerd in me) and this one is right up there on my list with Saving Private Ryan and Fury. If you have not seen it, pick it up. It is 110% worth it.